The Riviera Nayarit Convention and Visitors Bureau, the Bahía de Banderas Hotel and Motel Association, and the different organizers are backing these 10 events this month—events that not only will attract thousands of visitors but will also leave considerable economic revenue in the area. This exciting adventure is hosted on one of the Riviera Nayarit’s best beaches in the San Francisco community, affectionately known as San Pancho. Dance teachers and international music professionals from the Swing genre will share their knowledge and joy throughout an entire week of dancing and celebration. Visit their webpage. Learning and fun come together to create awareness for the care of the environment and to encourage a better quality of life. The event opens on Friday, March 8th at San Pancho’s Plaza del Sol with games, workshops, local products, and gastronomy, plus the presentation of the Pata de Perro Company. A parade from the Entre Amigos Community Center to the Plaza del Sol will kick off the festivities.Click here for more details on the event. This international sailboat race takes place in Banderas Bay. Since its inception 27 years ago it has strived to offer friendly, fun races with a formal, professional format. For more details. The 1st Raicilla, Mescal, and Artisanal Beer Festival takes place March 8-10 at the Marina Nuevo Vallarta with the participation of 40 well-known brands of alcoholic beverages and regional cuisine. It will be a weekend full of flavor, traditional beverages, great music, and fun activities. More details here. The Puerto de Chacala Music Festival, held from March 11-16, is the most important cultural and artistic event of the year in this coastal village of the Riviera Nayarit. National and international artists will be performing free for the general public in Chacala. Bands, dancers, solo artists, fine arts, and more are all part of the celebration. Visit the page. The APEN Mexico All-Star National Championship will be back in the Riviera Nayarit for the 8th time. About 20 teams from different states will show off their abilities in the Choreography or Dance and Acrobatics divisions. More info. The San Pancho Children’s Circus opens its doors for its annual fundraiser, this year titled “Fausto.” This is a magical and spectacular event, directed by project founders Gilles Ste-Croix and Monique Voyer. General admission: $550 MXN. Tickets for donation to the Dreamcatcher fund: $2,500 MXN. Children under two are free. All monies raised by the event will be earmarked for the San Pancho Children’s Circus youth programs. Click for more details on the event. The WesMex International Regatta 2019 will be held at Nuevo Vallarta’s Vallarta Yacht Club from March 5-9. The regatta is considered one of the five Mexican Circuit regattas by the Optimist, Laser, Windsurf, and 420 class associations. This year it will be the qualifying race for the 2019 World Optimist Championship, to be held in Antigua in July of this year. More information here. 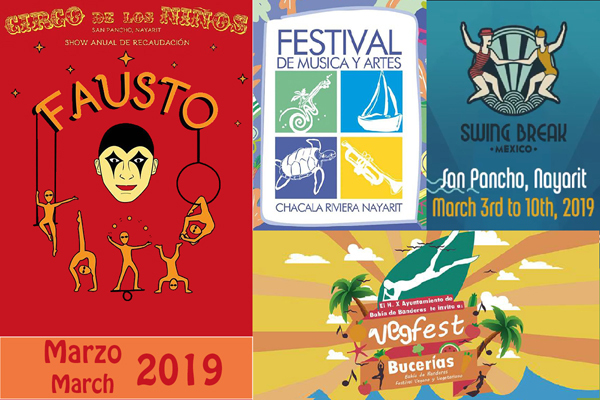 Rincón de Guayabitos is preparing to welcome the “bug fest” par excellence from March 30-31 during the 20th Guayafest 2019, with the participation of more than 300 Volkswagen cars from Mexico and the United States. The event is organized by the TPC Bugs Club Tepic and has the full support of the Compostela Municipal Hotel Association. For more info check out their Facebook page. The second edition of this Gran Fondo cycling circuit will take place on Saturday, March 30 with three distances, 21 km, 72 km, and 100 km, departing from Marina Vallarta. The Tourist Circuit is not a race but a family tour where anyone who has a bicycle is welcome to participate. The goal is to encourage sports and camaraderie, and to promote the natural beauty of Puerto Vallarta and the Riviera Nayarit. Click for more information. The Riviera Nayarit Convention and Visitors Bureau (CVB) and the Bahía de Banderas Hotel and Motel Association (AHMBB) support events as they generate visitors and lots of exposure thanks to the media coverage they obtain. The activities take place with the support of the Government of the State of Nayarit via its Tourism Promotional Trust (Fiprotur).